Go Back to the Homepage / Fukushima Worries? With the nuclear disaster in Fukushima Japan and many people worried about further incidences of I131 fallout, there has been a great deal of discussion about radioactive iodine, specifically I131 fallout. This is the same radioactive iodine used for treating thyroid disease. While I131 is an incredibly effective tool in the battle against thyroid disease, it also has the potential to do harm to healthy people who come into contact with it. 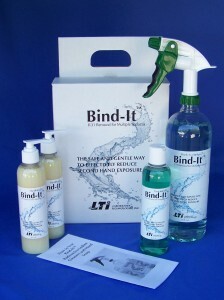 Bind-it™ products are designed to remove radioactive iodine contamination. Bind-it™ is primarily used in hospitals, nuclear pharmacies, laboratories and thyroid patient’s homes. Although not designed for it, Bind-it is also a very effective tool for radioactive iodine removal, including removing I131 fallout contamination. With the information provided by U.S. authorities, we see no reason to use Bind-it™ for Fukushima fallout cleanup in the U.S.. However, if you choose to purchase Bind-it for this reason, you can rest assured that, used as directed, Bind-it WILL remove any radioactive iodine contamination from your home and your skin. Bind-it is safe for routine use. The instructions included are intended to aid thyroid patients in finding and cleaning problem areas from the release of Radioactive Iodine from their bodies, not cleanup of radioactive iodine brought into the home. For fallout cleanup, follow the procedure basics included in your kit cleaning all areas you feel may be contaminated.